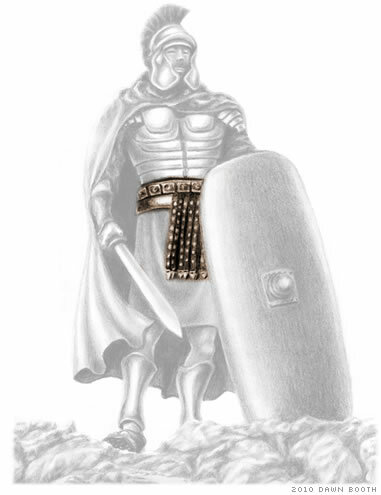 The first piece of armor Paul mentions in Ephesians 6:14 is "the belt of truth" (New International Version). What purpose did the belt serve for a Roman soldier? What purpose does the belt of truth serve for us? Discovery Channel's Mythbusters interviewed Deputy Shawn Osborne, whose standard-issue belt buckle deflected a bullet at close range, saving his life. In spite of a big bruise, Deputy Osborne knew he was "very lucky." Belt buckles are not designed to stop bullets. But there was a time when belts were an important part of defensive armor. Girded With Truth When the apostle Paul describes the armor of God, he is talking about more than a simple set of helpful tips. He is talking about the impregnable defenses of the Almighty God. These are keys to withstanding the attacks and onslaughts of the great dragon of old, Satan the devil. They are ultimate and infinitely powerful tools available to us as Christians. And he chooses to begin describing that set of armor by talking about...a belt? Why, of all things, a belt? He could have started with the mighty sword of the Spirit, the towering shield of faith, the shining breastplate of righteousness—anything but some measly old belt. But he didn't. So that begs the question—why? What was the belt used for in the Roman army? The belt—known as the cingulum or balteus—played a crucial role in the effectiveness of a soldier's armor. It was the belt that held the scabbard, without which there would be no place to put a sword. Imagine an overzealous soldier, fired up and charging out into battle—but without his belt, and consequently without a weapon! In addition, the Nelson Study Bible says from the belt "hung strips of leather to protect the lower body." The Matthew Henry Commentary says the belt "girds on [secures] all the other pieces of our armor." Truth should cleave to us as a belt cleaves to our body. Jesus, praying to the Father, gives a clear and straightforward definition of truth: God's Word. The Holy Bible (Scripture—the word of truth) was given by inspiration of God (2 Timothy 3:16). The Greek expression translated "inspiration of God" literally means "God-breathed"! He actively and fully inspired the Bible to reveal His truth to us. His promises, His commands, His word—they are all truth, plain and simple. After all, "The LORD of hosts has purposed, and who will annul it? His hand is stretched out, and who will turn it back?" (Isaiah 14:27). If God says something, there is no force that can stop Him from doing it—we can rest assured that it will be done. As Christians, we are to test all things and then hold on only to that which is good—the truth—discarding all else. We are to be like the Bereans who "searched the Scriptures daily to find out whether these things were so" (Acts 17:11). If we are not convinced that our principles and beliefs are without exception 100 percent true, how can we expect to accomplish anything? The belt used in Roman armor, as we have learned, provided a place for the soldier's sword. Our sword—the sword of the Spirit—likewise needs a sheath. Truth is vital because, like a Roman soldier's belt, it allows us to carry the sword of the Spirit and use it effectively. What other lessons can we learn from the biblical analogy of having our waist "girded" by a belt? Let your waist be girded and your lamps burning; and you yourselves be like men who wait for their master, when he will return from the wedding, that when he comes and knocks they may open to him immediately. Blessed are those servants whom the master, when he comes, will find watching. Assuredly, I say to you that he will gird himself and have them sit down to eat, and will come and serve them. Christ told us to always be watching and ready for His return. Peter used an interesting analogy: "Gird up the loins of your mind." This implies tucking in long garments to be ready to move quickly. The New International Version translates it as "prepare your minds for action." What are the dangers of not wearing the belt? The world we live in teaches that truth is what we make it—that good and bad are relative and that there are no absolutes, only equally valid opinions. But the Bible teaches that truth is God's Word—that good and bad are defined by Him and that there are eternal and unchangeable absolutes, uninfluenced by opinions. Paul wrote to the Romans telling them to "not be conformed to this world." Part of that means not buying into a system of belief that says absolute truth is a myth. As Christians, we know both that there is truth and that it is absolute. Imagine a belt with a segment missing. No matter how tiny the sliver that isn't there, the belt is still useless. To do its job, it must be one continuous, unbroken piece. Now imagine living a way of life you don't completely agree with. Maybe it doesn't seem like a big deal—after all, what are a couple minor points that you're not sure about? They are everything. To try to live God's way without total belief in its validity is like trying to hold your sword up with a belt that isn't continuous. Neither will work. Our trust in God and His Word must be solid, without break, or else we will quickly find ourselves without a weapon. No matter how effective the rest of our armor is, we are useless without our sword. We need to be rightly dividing the word of truth—knowing what we believe, and why. So—how secure is your belt?